Luis Quiroa comes from Guatemala, Central America. 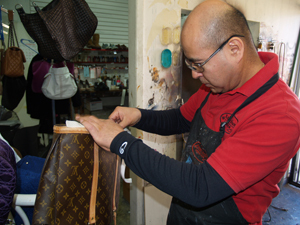 He learned his craft while working at Maya Shoe Repair in Santa Monica, California. He trained for 5 years then, worked for Arturo’s Shoe Fix in Beverly Hills for 10 years. He later came to came to Las Vegas and started business with Manuel Morales. Shoe repair is an art. Fixing and detailing shoes is our specialty. There’s a safety factor to a shoe. Specializing in all types of shoes so that they are comfortable along with remaining fashionable. “We make your shoes look and feel good”. No job is too big or too small for us. We treat each customer as a family member always looking forward to seeing and welcoming you. Drop off and pickup for businesses are no problem. We specialize in repairs and maintenance of shoes in a timely manner. Ask us about our clientele. We provide our services for many shows that perform on the Las Vegas Strip, dance companies, backstage workers, fashion, athletic, etc. We specialize in cleaning, dying to match, leather jackets, luggage, purses, boat canvas, upholstery, just let us take a look and together we can decide what approach to take. We do research to maintain findings on all types of brands. We include designer hardware depending on each piece. We will restore the designer findings to the best of our ability. Manuel Morales comes from El Salvador, Central America. He learned all the different types of stitching for all shoes and luggage. He is a master at making items from scratch and can duplicate almost anything. His photo and example book is always available to view before beginning any client’s project. He came to The United States in 2000 in Los Angeles, California. Luis and Manuel met in Las Vegas. Both Luis and Manuel complement each others work. They offer a full detailed service. Clients include Cirque du Soleil, Wayne Brady, Amargosa Opera House, and numerous clients that believe in high quality designer clothing and repair. We welcome you to visit us anytime to look at the detail and work we do. No job is too big or too small. 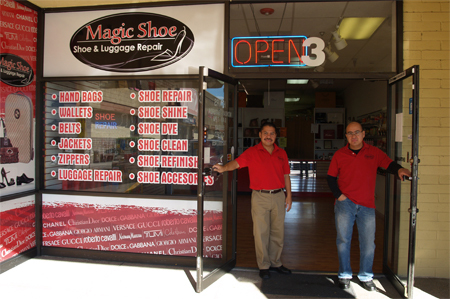 We have been nominated by the Las Vegas Review Journal as the #1 Shoe Repair in Clark County. Our magic is simple, we do things one stitch at a time. They started with a dime and now are living the dream. They own the best shoe repair in town. This is the magic of Magic shoe repair.